I was recently sent Enjoy Life's new "boom Choco boom" bars to sample. Enjoy Life has long been one of my favorite brands but I must say I was skeptical of a chocolate bar being good that was gluten free, dairy free, and soy free. However, I was pleasantly surprised! All 3 varieties that I sampled (rice milk, dark chocolate, and crispy rice) were delicious and tasted just like a "normal" chocolate bar! 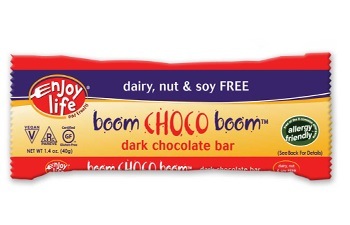 In addition to being gluten free, dairy free, and soy free, the "boom Choco boom" bars are egg free, peanut free, tree nut free, certified vegan and kosher plus they are made in a dedicated nut and gluten free facility! 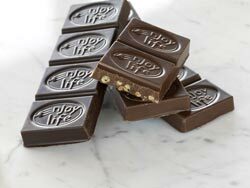 Visit their website at www.enjoylifefoods.com to download a coupon to save 75 cents on any two chocolate bars. You can purchase these bars at many grocery stores and health food stores nationwide. 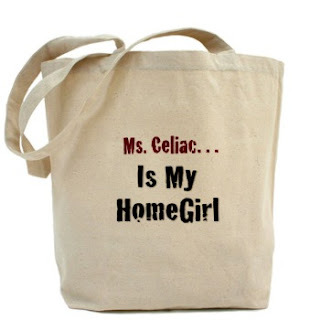 You can also buy them in bulk at Ms. Celiac's Market! First of all, I want to say that I hope everyone has a delicious gluten free Thanksgiving holiday tomorrow! I am thankful for all of my viewers and the fact that we have now had over 25,000 unique visitors! Keep spreading the word! On another note, congratulations to the winner of the Live Gluten Freely Giveaway courtesy of General Mills via MyBlogSpark! 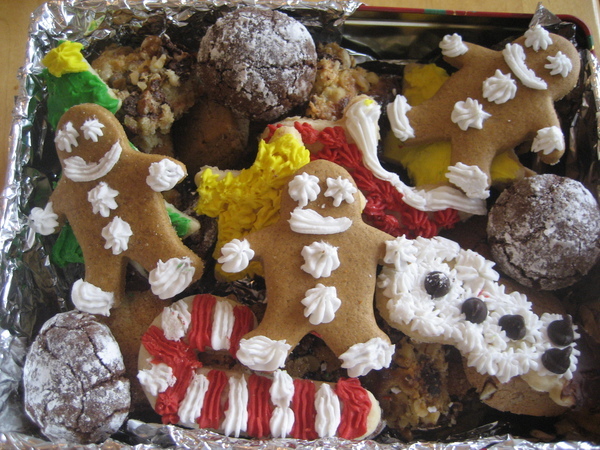 Ginger Garza of Bainbridge Island, Washington will be receiving a large package of gluten free General Mills products! 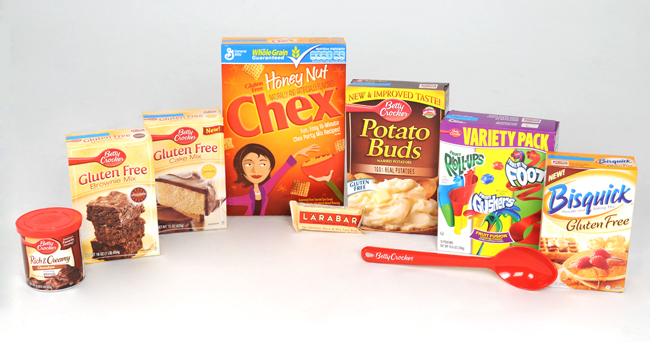 General Mills is proud to offer more than 300 affordable gluten-free products that are available in grocery stores nationwide. In addition, they have created an online community that provides gluten free recipes, tips, coupons and new product information! 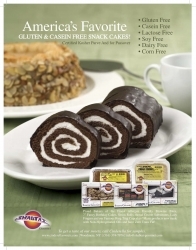 If you haven't yet, make sure to visit their website at www.liveglutenfreely.com and sign up for their newsletter. Also, visit their Facebook page at facebook.com/glutenfreely and make sure to "like" them! At Liveglutenfreely.com, you can find recipes ranging from Basil-Spinach Dip to Banana-Pecan Waffles to Apple Streusel Cheesecake Bars to Chicken and Vegetable Pot Pie. What food product would you like to see available gluten-free? Also, make sure to include your name, address, and phone number. The contest deadline is November 24th at noon (EST) so make sure to get your entries in quickly! Good Luck! 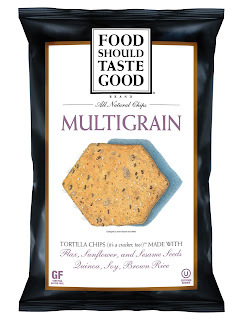 I first encountered Food Should Taste Good's All Natural Tortilla Chips this summer when I enjoyed my first bag of the Multigrain and Olive varieties. It was at this point that I became hooked! I enjoyed the flavor and how light and healthy they seemed in comparison to a bag of greasy potato chips. In fact, they do have many health benefits. They are free of cholesterol, preservatives, trans fats and GMOs. They are also certified Kosher and Gluten Free, as well as, being low in sodium and a good source of dietary fiber. They also recently sent me a sample pack including such delicious flavors as the Sweet Potato, The Works!, Blue Corn, Cheddar, and Multigrain. And they are giving me the opportunity to give one of my lucky readers a free sample box! The winner will be randomly selected and announced on Saturday, November 13th! All entries must be received by Friday, November 12th at noon (EST). So, hurry up and send in your entries! Are you looking for a tasty autumn recipe to create that is also gluten free? If so, these Pumpkin Chocolate Chip muffins are the perfect option. 1) Preheat the oven to 350 degrees Fahrenheit. 3) Mix together the rice flour, potato starch, and tapioca flour until well blended and set aside. 4) Combine together the eggs, vegetable oil, sugar, and pumpkin. 5) In a separate bowl, mix together the gluten free flour mixture, baking soda, cinnamon, and salt. 6) Slowly, add this mixture to the wet ingredients. 7) Finally, stir in the chocolate chips. Now all you have to do is spoon the batter into the muffin tin until they are 3/4 full. Bake in the oven for approximately 25 minutes. Gluten Free Microwave Mug Cakes! 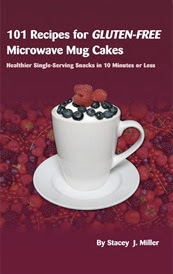 Author Stacey Miller appeared last year on The Rachel Ray Show to promote her book, 101 Recipes for Microwave Mug Cakes. Many of her fans contacted her asking for gluten free versions of these recipes, so she has now released a new book entitled, 101 Recipes for GLUTEN-FREE Microwave Mug Cakes. This is the perfect book for someone who enjoys baking their own snacks but only has 10 minutes or less and just wants a single-serving. All you need to make these recipes is a microwave oven, a mug, a saucer, a mixing bowl, and a few ingredients! Mix the ingredients in a small bowl. Beat egg first with a spoon and mix in other liquid ingredients. Then add dry ingredients and mix until you've removed all the lumps. Pour the batter into the mug (do not fill more than halfway) and smooth the top with a spoon. Thump mug firmly on the tabletop six times to remove excess air bubbles. Place mug on top of a microwaveable small plate or saucer. Bake for 3-4 minutes. Check for doneness by inserting a toothpick in the middle of the microwave mug cake and removing the toothpick. If the toothpick is dry, the MMC is done. Wait 2 minutes, then run a butter knife along the inside of the mug and tip the cake onto a plate. Position the mug cake so that the slightly rounded surface is on top. Your microwave mug cake will now look like a slightly overgrown muffin. Frost the whole The Great Pumpkin Microwave Mug Cake with whipped cream or split the MMC in half and frost each half individually (in which case you'll end up with two separate MMCs - or you can reassemble the frosted halves to create a layered MMC). Sprinkle, if you wish, with McCormick ground cinnamon. The winner of the Gluten Free Bisquick Giveaway is Cheryl Free of Fort Wayne, Indiana who says she will be making Gluten Free Cheese Garlic Biscuits with the Bisquick Gluten Free Baking Mix! She will be receiving a Bisquick Prize Pack courtesy of Bisquick and MyBlogSpark that includes a box of Bisquick Gluten Free Baking Mix, a pancake pan, pancake pen and a pancake flipper. Congratulations to Cheryl and thank you to everyone who entered! We will be hosting even more contests in the future so stay tuned! As it is getting closer to Halloween, I wanted to provide you all with an updated list of gluten free candies that you are sure to find in your trick-or-treat bags! This list is by no means exhaustive, so just because your favorite candy isn't included doesn't necessarily mean that it is not gluten free. This is just a list to get you started. As always, please double-check with the manufacturer as product ingredients are constantly changing. I hope everyone has a safe and happy Halloween! I will be taking my dog, Monroe, out this year dressed as a candy corn (photographed above). For all of you with Celiac Disease or for those of you who know someone with Celiac Disease, Triumph Dining's The Essential Gluten-Free Restaurant Guide 5th Edition is an absolute must buy! This book includes over 6,500 restaurants which is over 1,500 more than in the 4th edition. Even better is that over 2,800 of the restaurants listed have gluten-free menus or gluten-free specialty items. In this new 5th edition, they have also added over 40 chain menus so that the book now includes over 120 gluten-free lists and menus from chain restaurants throughout the United States! Triumph Dining has managed to find gluten free restaurants in all 50 states and in cities and towns both large and small! This is the perfect guide to bring with you on vacation and is even great to you use in your own town. I was certain that I knew every gluten free restaurant in my neighborhood, but to my surprise there were several places just around the corner that I never even knew existed! So, no matter if you were just diagnosed with Celiac Disease or you were diagnosed many years ago, this book makes for an excellent purchase and is almost certain to lead you to find some new gluten free restaurants! To purchase, please just click on ad and follow the easy-to-order instructions! 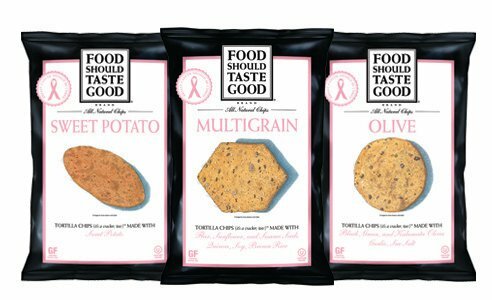 October is Breast Cancer Awareness Month and to show their support the company, Food Should Taste Good are changing the color of their Multigrain, Olive and Sweet Potato bags in honor of the cause. Every time that you purchase one of these pink bags, they will donate 5 cents to a participating charity. Their goal is to raise $75,000. 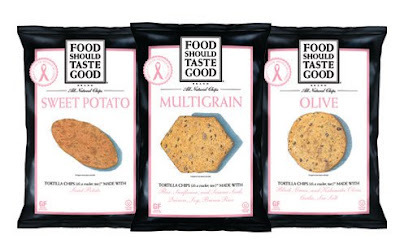 And since these chips are gluten free, it is something that all of us with Celiac Disease can participate in! 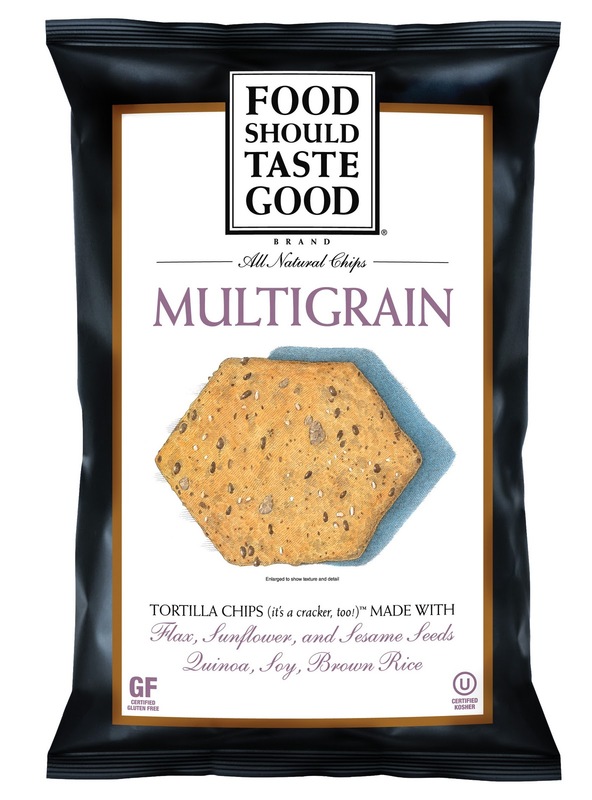 In addition to being gluten free, Food Should Taste Good chips are all natural, kosher, contain no MSG, are low in sodium, trans fat free, lactose free, cholesterol free, contain no preservatives, are not genetically modified and are a good source of dietary fiber. They are sold at Starbucks and grocery stores throughout the United States. So, get out there and look for these pink bags to support a good cause! For more information, please visit www.foodshouldtastegood.com. Do you ever wish that you could just walk into a mainstream grocery store and pick-up a gluten free baking mix? Well, now you can! 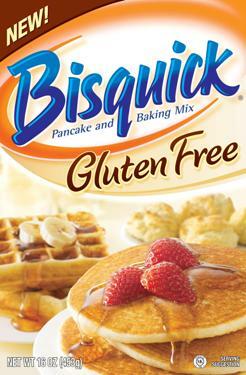 Bisquick has just released their very own Gluten Free Baking Mix. You can use it to make pancakes, waffles, biscuits, pizza crusts, cakes, and much more! If you're not sure what you want to make with it, then just visit www.bisquick.com/glutenfree for a plethora of gluten free baking ideas such as apple pie, strawberry shortcake or chicken fingers! Bisquick Gluten Free Baking Mix is made in a gluten free processing facility and can be found in the baking aisle at your local grocery store. And thanks to Bisquick and MyBlogSpark, we are giving away a Bisquick Prize Pack just like the one we received! 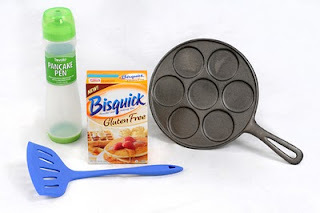 This pack includes a box of Bisquick Gluten Free Baking Mix, a pancake pan, pancake pen and a pancake flipper (see photograph). To enter, just send me an email at MsCeliacSays@gmail.com with "Bisquick Contest" in the subject line and your name, address, telephone number, and what you plan on making with the new Bisquick Gluten Free Baking Mix in the body. All submissions must be received by midnight on October 21st! Gluten Free At The Market! A few weeks ago, I finally got around to trying Friedman's Lunch at NYC's Chelsea Market. I had heard so many excellent things about their gluten free offerings that I couldn't wait to try it out and I was definitely not disappointed! First of all, I learned that they get their gluten free baguettes from Everybody Eat's, their challah rolls from Katz Gluten Free, their sandwich bread from Udi's and their bagels from Joan's. So, considering those are some of the best gluten free brands out there I was sure the food was going to be delicious. I ordered the Smoked Salmon Plate which usually comes with smoked salmon on a gluten free bagel. Unfortunately, they were all out of the bagels when I was there but I did get to enjoy it on some delicious gluten free toast! For a side, I tried the Herbed French Fries which were amazing! I definitely recommend ordering them! Friedman's Lunch is open seven days a week for breakfast, brunch, lunch and dinner. They offer a variety of gluten free items from pancakes to eggs to soups to salads to sandwiches to pasta to tacos and everything else that you could possibly think up! In addition to having so many gluten free options available they also use all natural, antibiotic free beef and turkey, organic chicken and eggs, and mostly locally grown produce. So Many Gluten-Free Options at Cafe Rustica! A few weeks back, I was able to try Cafe Rustica in Great Neck, New York for the first time and I was very impressed! They have a large selection of gluten free options including pizzas, pastas, and wraps. I ordered the Pizza Margarita (fresh mozzarella, cherry tomato, and basil) and a gluten free breadstick for my meal and the Silk & Satin Cake (New York style cheesecake layered with chocolate mousse and topped with bittersweet chocolate ganache) for dessert. I also took out an Azure Wrap (grilled chicken, walnuts, celery, arugula) for lunch the next day. I loved everything! The pizza crust was thin and delicious! The breadstick and wrap were equally yummy and the cheesecake was absolutely delectable (and I don't even usually like cheesecake!). In addition to the pizzas, pastas, wraps, and desserts, the gluten free menu also includes chicken, veal, and fish entrees along with a wide variety of salads. Today, September 13th, is National Celiac Disease Awareness Day! And as promised, we will be announcing the winners to our Katz Gluten Free Giveaway! The Winner of the $25 Katz Coupon is....Caren Haug from Virginia! We will definitely be hosting more contests in the future! So stay tuned to www.msceliacsays.com for your chance at winning! A few weeks ago when I was on Long Island, I discovered a gluten free booth at the Tanger Outlets at the Arches' Farmers Market in Deer Park, NY. The brand is Cooking with Chef Michelle and they had an assortment of gluten free treats including breads, cakes, and muffins. So far, I have been able to sample the Coffee Cake, the Double Chocolate, and the Chocolate Chip Muffin and all three were extremely delicious and tasted just like I remember "real" muffins tasting. Currently, the products are only available at the Farmers Market which runs every Saturday from June 12th - November 20th. It is open from 11 am - 3 pm.